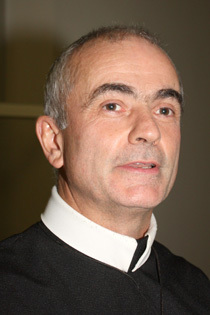 On Nov. 4, 2009, Father Michael Brehl was elected the 17th Superior General of the Redemptorists, the first Canadian to hold the position. He succeeds Father Joseph W. Tobin, of the Denver Province, who had served as Superior General for 12 years, but was ineligible for re-election due to the statutes of the Congregation. The Director of Communications for the Redemptorist General Government in Rome, Father Gary Ziuraitis, recently sat down with Father Brehl for a post-election interview. Father Ziuraitis: For the next six years you will lead 5,300 Redemptorists scattered in 78 countries. What are your priorities at the start of your mandate? What are today’s pressing concerns for the Congregation in the continents in which we work? Father Brehl: As the Redemptorists entered this General Chapter, and as this General Chapter finishes, our first consideration is simple: Where is God calling us to bring Good News to the abandoned and the poor? Our first priority is to respond to the call of God and the cry of the abandoned and the poor with fidelity and hope. — Strengthening and developing structures which foster an effective international solidarity among all Redemptorists and those who work with us. — A renewal of our Redemptorist Apostolic Life which will result in greater freedom and availability for the Mission. — Formation of new members, and ongoing formation of all Redemptorists, to better equip us for missionary service to God’s people. — A critical examination of our human and temporal resources in order to make concrete, prudent and courageous plans for the future. Father Ziuraitis: The Congregation is characterized by a missionary impulse and evangelization. How does it live out this today in a globalized world on the one hand and a world marked by a deep crisis of values and finances on the other? Father Ziuraitis: In the United States and Canada, (and in other countries of the world where the Congregation is present) what pastoral challenges does it face with immigrants? Does the internationality of the Congregation help you in this mission? Father Brehl: Yes, the internationality of our Congregation is a great help in the mission to be present to the communities affected by mass migration. Until the present moment, I have been living in Toronto, Canada — which the United Nations says is the city most affected by immigration. About half the residents of this city were not born in Canada! In Toronto, we have Redemptorists from nine different countries serving God’s people. The migration of peoples presents a number of pastoral challenges. First of all, immigrants or migrants often experience a profound sense of loss, disorientation and isolation. Language, culture, family, familiarity — in many cases they have left all these behind. Some are migrating freely, attracted by new opportunities. Others are fleeing situations of danger. At the same time, migration deeply affects the families and communities which are ‘left behind’. Both situations present pastoral challenges. Then there are also the challenges of integration and welcome. Xenophobia, especially in societies which are affected by unemployment, continues to arise. The ‘welcoming community’ or country is not always so welcoming! In a very real sense, pastoral ministry begins with accompaniment — becoming neighbours. Accompaniment always leads us to ask deeper questions which are often concerned with structural questions.